Clinton-Massie captains Griffin Laake (87), Matt Phillips (65), Daulton Wolfe (10), Spencer Voss (57) and Tyler Beam (20). 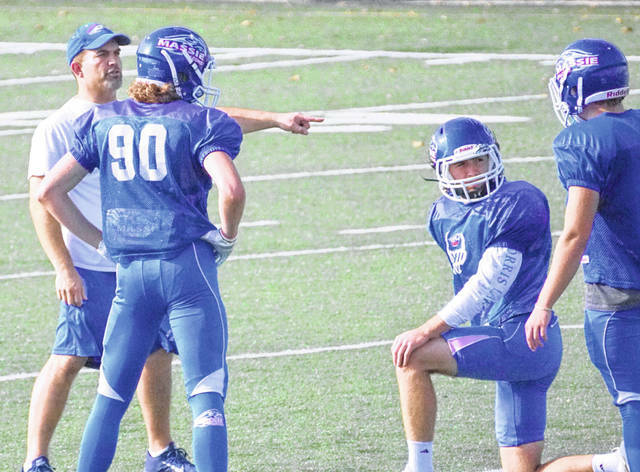 Coach Scott Rolf (left) works with the Falcons during practice last week. There was one piece missing along the Clinton-Massie offensive line as the 2018 season began. Schmidt, a massive tight end in 2017, was being recruited by Ball State University as an offensive tackle. So the move seemed like a natural fit. By moving one spot over, Schmidt gave up his chance for touchdown glory. Wait, the Falcons don’t throw the ball much so his chances of getting a touchdown didn’t go down much. “They’re pretty low,” Schmidt said with a chuckle. With Schmidt (6-5, 255) in place, the Falcons offensive line is overpowering most opponents. Matt Phillips (6-3, 275), Davis Wulf (6-2, 240), Seth Stiverson (6-1, 235), Spencer Voss (6-5, 270) and Colton Doyle (5-11, 200) are big and athletic. They set a goal of 4,000 yards rushing this season. Led by Brendan Lamb’s 1,090 yards, the Falcons have 4,235 yards on the ground. Dating back to a 2009 playoff loss to Kettering Alter, 32-7, Clinton-Massie has become more focused on athletic linemen who could move. “We saw how much better speed was than physical size,” CM coach Jeskee Zantene said. As a former tight end, Schmidt fits that big perfectly. To reshape the offensive lineman, literally, the CM coaches altered their ways. REVENGE FACTOR: Thomas Myers figures previous meetings between London and Clinton-Massie will become a battle cry for the Red Raiders. The Falcons were 62-13 winners at London in 2012. They won 49-7 in 2011 at CMHS. Dating back to the 2005 season, when Massie joined the SCOL, Clinton-Massie has an 8-0 series advantage. The Falcons have outscored the Red Raiders 371-87. PHYSICAL GAME: With both teams employing a run-first offense, this game will likely be won in the trenches. And that suits the 5-9, 165-pound Nathan Allgeyer just fine. “They’re pretty physical,” Allgeyer said. “They run similar stuff to Goshen and that puts me inside the box, down on the line as a linebacker instead of out on somebody like twins as a DB (defensive back). I’m a run stopper as opposed to a pass stopper.